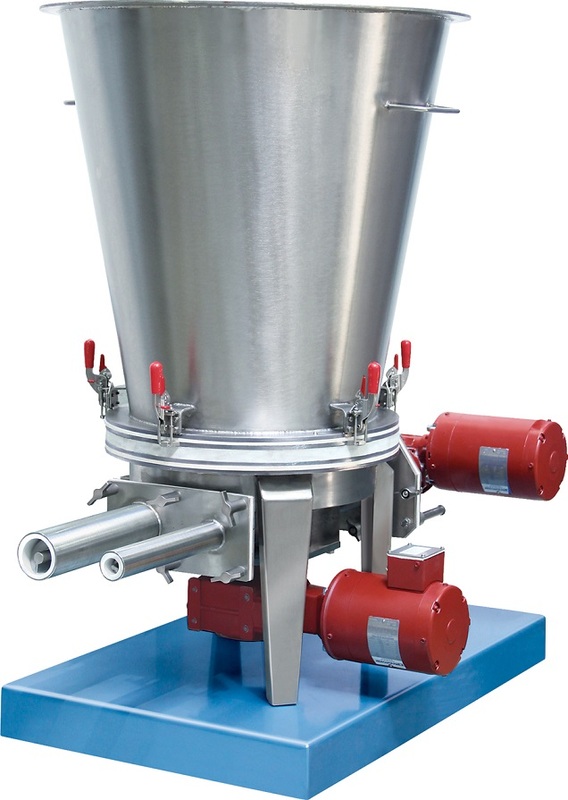 Acrison Inc. introduces the new Models 170-1-2 and 170-2-2 dry solids volumetric feeders. The Models 170-1-2 and 170-2-2 are designed with circular flat bottom feed chambers and feature a specially configured, slowly rotating horizontal agitator that operates at a constant or variable speed to ensure the feeder's two variable speed metering augers are completely filled with consistent, "conditioned" product, while simultaneously aiding downward flow of bulk material from the 170's integral supply hopper into the feed chamber. Proper sizing of two independently driven metering augers vs. use of a single auger with a limited feed range enables a wide feed range (over 130:2) with the Model 170-1-2 capable of a maximum throughput of 84 cu ft/hr and the Model 170-2-2 160 cu ft/hr. Both models are designed to self-empty via a discharge port located in the flat bottom feed chambers. In batching applications, use of a large metering auger allows high material feed output for the desired batch size, while use of a smaller metering auger provides a final dribble amount so the highest degree of batch accuracy can be achieved.